Rio Salado College | RioNews: Partnerships Team Receives AZ DPS Award! Partnerships Team Receives AZ DPS Award! 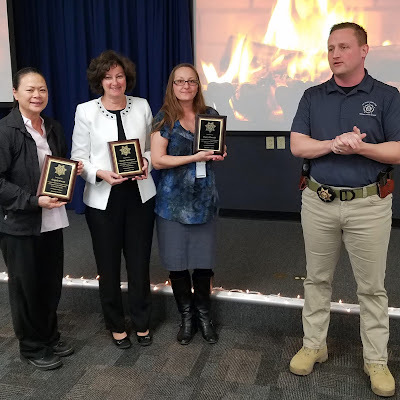 Arizona Department of Public Safety recognized Rio Salado College Partnerships on December 11, 2018, with an award of appreciation for our partnership and support to the DPS Leaders in Training Program. Rio Salado College has had an Educational Service Partnership with AZ DPS since 2000 for their Advanced State Trooper Academy. In 2016 they launched a Certificate of Completion in Public Safety Leadership. This program is designed to provide law enforcement persons with the training needed for transition into leadership positions in law enforcement. Since the program began, approximately 100 of their capstone projects have been implemented resulting in significant cost savings, increased efficiencies, and better communication within the department. Pictured above, left to right: Angela Kwan, Susan Lawrence, Darcy Breault, and Captain Daven Byrd, AZ DPS. News courtesy of Rio Salado’s Partnerships team.